In my experience, two types of people inhabit the world: those who say disdainfully, “Math? My accountant will take care of that stuff!” and those who gleefully declare, “Ooh, more numbers!” No matter which camp you belong to, after you read this part, you’ll find SAT math approachable and, perhaps, easier than you anticipated. This part begins with a brief fly-by of the exam’s Math section, all 70 glorious minutes of it, and moves on to more ­in-depth analysis and techniques for each topic covered on the test. To ruin just a tiny bit more of your life, I also include practice questions that are very similar to the ones you’ll see on test day. If you’re one of those people who whined to your ninth-grade math teacher, “No one in the real world ever has to calculate the value of 6x – y,” the SAT is about to prove you wrong. You can’t get much more real world than a test that helps to determine where you go to college and maybe even what sort of job you get afterward. And on the SAT, the value of 6x – y is fair game. So are absolute value (and I’m not talking about the great price you got on that orange sweater), exponential growth (the kind your tuition payments will display), and plenty of other fun stuff. In this chapter, I show you what’s where, how to prepare, and most important, how to survive the SAT Math section. The SAT booklet you open with sweaty, trembling fingers one morning in the near future will contain three sections of math that count toward your score: two 25-minute sections and one 20-minute section. You may also encounter an equating section that allows the SAT makers to try out new questions. You pay them to let you take the test, and they treat you like a lab rat. Nice, huh? The equating section doesn’t count toward your final score, but because you never know which section is equating, don’t blow off anything. You may end up ignoring a section that matters. Each Math section begins with a little gift basket: a set of formulas to help you solve the problems — the area and circumference of a circle, the area of a square, the angles and sides of “special” triangles, and so forth. As you plod through an SAT Math section, look back whenever you need this information so you’re sure that your nerves haven’t changed, say, the area of a rectangle from a = lw to a = lw2. The SAT Math sections are mostly five-answer multiple-choice questions. Ten questions are grid-ins, which require you to bubble in the numbers you come up with, thus, giving you no hint whatsoever about the correct answer. (Check out the section “Knowing When to Grid and Bear It” later in this chapter for everything you need to know about these questions.) Expect to see problems relating to topics commonly covered in the first three years of high school math. In other words, you’ll see questions on numbers and operations, algebra and functions, geometry, statistics, probability, and data interpretation. For more specifics, read on. Arithmetic: You have to add, subtract, divide, and multiply and show understanding of even and odd numbers, positive and negative numbers, and primes. Exponential growth sequences, also known as geometric sequences: These questions require you to multiply by a certain number in order to get to the next term in the sequence. For example, the number of bent wire hangers at the bottom of my closet on consecutive days is 4, 12, 36, 108, 324 . . . you get the idea. You may be asked to create a mathematical statement expressing the way my wire hanger collection grows. Percents: How much will you have to pay if your book bill increases by 4,000 percent? Ratios and proportions: If the ratio of tuba players who try out for Prestigious University to those that get in is 2,000 to 3, how many tuba players are accepted out of the 4,000 that apply? Sets, including union, intersection, and elements: The set of all the parakeet treats I buy and the set of all the parakeet treats that my birds will actually eat (instead of strew around my living room) overlap slightly. The SAT may ask you to identify common elements or ask other questions about two or more sets. Absolute value: How far away from a particular point on the number line is another number? That’s the absolute value, which may show up in equations or functions. Equations and inequalities: It’s time to have fun with equal signs, as in 3q + 4 = the number of hours you groan while learning stuff like this. This category also includes quadratic equations, which have things like x2 in them, such as x2 + 8x + 15. Exponents: These little numbers tell you how many times to multiply something by itself, as in x4. You may see positive, negative, and fractional exponents. Factoring: Factoring is the math equivalent of extracting the cocoa powder and flour from a brownie after it’s baked. Here’s a typical factoring problem: If a rectangle has a length of x + 3 and an area of x2 + 8x + 15, what is its width, in terms of x? Functions: I’m talking not about my cousin Thelma’s fundraiser for impoverished beekeepers, but about problems in which you take a number, do some stuff to it, and end up with a new number. Functions, which are written as f(x), appear in a number of guises, including the graphs of linear and quadratic functions. Special symbols: These strange figures have been created just for the SAT; in other words, they don’t exist in normal math. You have to figure out, given the definition, how to manipulate these symbols. Areas and perimeters: This topic covers the basic how-much-carpet-and-baseboard-to-buy question for common shapes as well as weird forms. Also, you may find questions on volume. Coordinate geometry: The SAT asks about slopes of lines, including parallel and perpendicular lines. Also, if point G has the coordinates (x1, y1) and point W has coordinates (x2, y2), what is the midpoint when I spread cream cheese on a bagel? Just joking about the bagel, but you do have to know midpoints. You may also have to interpret the graph of a function and to answer questions about transformations of a function. An example: If f(x) measures how much time Gloria spends on her cellphone, how will f(x) change the day after her unlimited calling plan starts? Parallel and perpendicular lines: This topic questions you about what parallel and perpendicular lines do when they’re alone in the dark, what kind of angles cut into them, how they behave under pressure (when they have to take the SATs, for example), and so forth. Quadrilaterals and other polygons: The SAT folks may throw you a quadrilateral quiz or a polygon problem. Averages: Make friends with the three Ms — median, mode, and mean. Geometric probability: If I’m hanging a picture on my kitchen wall, what’s the probability that I’ll drive the nail right through a hot-water pipe? Logic: This topic covers those horrible problems you never see in real life, such as What is the seating plan if Mr. Green can’t sit next to Ms. Red but must sit across from Violet and behind Orchid or he throws popcorn . . . Wait, I just flashed back to the seating plan at my wedding. You do use this stuff in real life! Probability: If you wash and dry 12 pairs of black socks and a pair of white socks, what is the likelihood that you’ll match two socks right out of the dryer? Scatterplots: No, the term doesn’t refer to incompetent mystery writers. Scatterplots are bits of data represented on a graph. The test writers may show you a bunch of dots, where the x-axis represents the amount of time spent reading this book and the y-axis shows students’ SAT scores. You may have to answer questions about the data, such as exactly how brilliant you were to buy SAT For Dummies, 8th Edition. Anything in the preceding list resemble a foreign language? Probably, because math is a kind of language. If you need to brush up on one or more of these topics, check out the relevant chapters in Part IV for review and practice problems. So you can bring a calculator. Big deal. The SAT makers declare that you can solve every problem on the test with brainpower alone, and they’re right. But you’re not allergic to a little help, are you? In fact, a calculator may not be the absolute number-one requirement for doing well on the Math section, but it’s pretty high on the list. Let me tell you a little secret of success: Become best friends with your calculator before the exam. Don’t waste time on SAT day trying to find the right buttons. In addition to doing everything a scientific calculator accomplishes, a graphing calculator also lets you draw graphs. If you have one you’re comfortable with, bring it along to the test. If you don’t own a graphing calculator, don’t rush out and buy one because the instruction manual is about 100 pages long (I’m not joking) and you don’t really need ­graphing capability on the SAT. All calculators come with instruction manuals. After you find your manual, read it. Practice the more complicated-looking procedures with problems from a math book or from this book. Fractions, decimals, and percents should be first on your list. If you’re not getting the right answers, ask a fellow student or your math teacher for help. Knowing in advance how to push the right buttons can save you time and give you more right answers, and that’s why you’re taking the test. If you’ve lost your manual, get a copy from the manufacturer. (Check the calculator’s serial number and the Web site or information telephone line of the company that made it.) Or buy a new calculator if you can possibly afford one. Spending a few bucks on a new calculator now will pay off big time when you receive your scores. If you don’t own a calculator, don’t worry. Although the SAT doesn’t supply calculators, some schools do provide loaners to students who don’t have their own. Talk with your math teacher. (Home-schoolers, call the local high school to inquire about access to their supply.) The most important thing is that you’re familiar with the calculator you plan to take to and use on the test. If your batteries run out during the test, too bad. Don’t expect the proctor to plunk a triple-A on your desk. Moral of the story: Have fresh batteries in your calculator before SAT-day morning. Finishing every problem on the Math section of the SAT in the time you’re given is certainly possible. However, finishing every question the SAT makers hit you with and getting them all correct is extremely unlikely. Furthermore, if you’re in a mad rush to finish a section, you’re going to make some mistakes that you would never have made had you worked at a slower pace. Is it just me, or are there more exponents on the bottom of the page? The correct answer is (E). The SAT makers arrange the problems roughly in the order of difficulty. (How do they know what’s difficult and what’s easy? They make you slog through equating sections and gather data on the number of wrong answers, that’s how.) Don’t assume that all the arithmetic questions are easy and all the third-year math problems are tough. The SAT makers try to include varying levels of difficulty for each topic, regardless of when it shows up in your high school ­curriculum. Take a shot at all the questions in the first third of each math set and attempt to figure out the middle third, if you can. Hit the last third of a set of problems only as time allows. Ten of the most fun questions (just kidding — they’re as boring as everything else on the exam) are grid-ins. Sadly, you don’t get five convenient multiple choices for a grid-in. On the other hand, you don’t lose any points for a wrong answer, so guess as much as you want. Figure 11-1 shows a sample blank grid-in. Figure 11-1: A blank grid-in. Write your answer and then darken the ovals. Grid-ins have little boxes in which you can write your answer, but the scanner doesn’t read the boxes, just the darkened ovals. But even though only the bubbles are scored, don’t skip the writing part because you may “bubble” inaccurately. You can’t grid in negative numbers. The grid has no minus sign. Hence, all answers are positive. Gridding in mixed numbers is impossible. If you grid in 51⁄2, the scanner reads “51 over 2,” not “five and one half.” Solution: Convert your answer to an improper fraction (one that has absolutely no manners and behaves scandalously on Saturday night). In the preceding example, grid in 11⁄2 (11 over 2), as shown in Figure 11-2a. You may also choose to grid your answer as a decimal. You can start from the extreme left or right, and the middle, too. Just be sure that you have enough boxes for the answer you want to record. Don’t place zeroes before a decimal point. If your answer is .5, darken the oval for the decimal point and the five, not 00.5 (Figure 11-2b). If your answer is a repeating decimal, fill in all the boxes, rounding off the last number only. In other words, darken the ovals for .333 or .667 (1⁄3 and 2⁄3 expressed as decimals), not .3 or .67 (Figure 11-2c). If your answer isn’t a repeating decimal (.4, for example), you don’t have to fill in all the boxes. Just darken a decimal point and a 4. Don’t agonize over the perfect, correct answer. Some grid-ins have several possible right answers. (Usually those problems say something like “a possible value for x is . . .”) Just find one of them and you’re all set. Also be aware that when there are several possible correct answers, sometimes the problem will ask for the least or greatest answer. Figure 11-2:Three grid-ins, properly filled in. Read the question and figure out what the SAT makers want to know. Circle significant words such as greater than, percentage, and so forth. Use the booklet as scrap paper. Write your calculations in the extra blank space, but no matter what, take time to bubble in your answers. Even though the proctor collects the test booklet, the information in it doesn’t count toward your score. Don’t overuse the calculator. See if a simple math approach gets you to the right answer. Keep an eye on the clock. You get as many points for each correct answer to an easy question as you do for a correct answer to a hard question. Don’t spend five minutes on one hard question and skip 11 easy questions because you run out of time. Follow the guessing guidelines I outline in Chapter 1. You lose a quarter point for each incorrect multiple-choice answer. Grid-ins take nothing away from your score if you’re wrong, so guess as much as you want on those questions. Try out the multiple-choice answers and see which one works. If the SAT writers ask something like “Which number is divisible by both 13 and 14?” start plugging in the answers until one of them works. 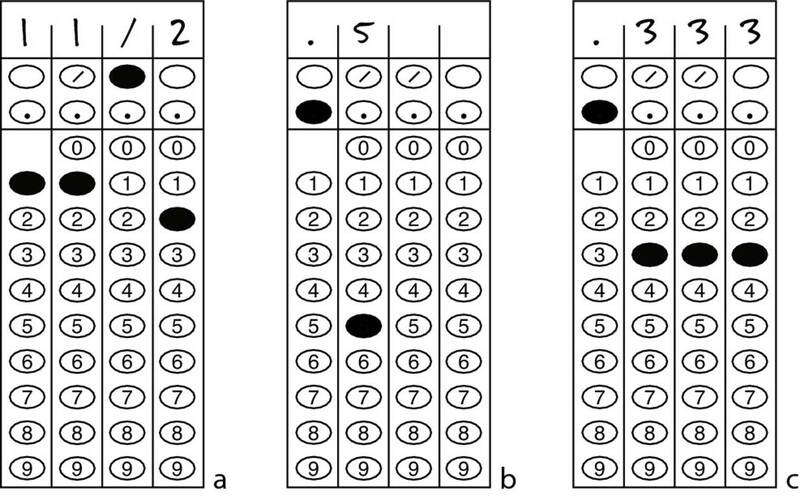 SAT multiple-choice answers are usually in order from smallest to largest. When you plug in, start with Choice (C), and check whether you end up above or below the target. Then try (B) or (D), depending on the direction you need to go. Think of realistic answers. The SAT Math section isn’t tied tightly to the real world, but it’s not from Mars either. If you’re looking for a weight, don’t choose “5,098 pounds” unless you have a truck on the scale. Think about the range of human body sizes and concentrate on answers in that category. Similarly, if you’re looking for a discount and come up with a negative sale price, you’ve done something wrong. Try again. Be sure to answer the question being asked. Often in your calculations, you may derive an intermediate answer that may appear as an answer choice but isn’t the final answer to the question asked. Multi-plying and div-iding. Think multiply when you encounter multinational (many nations involved), multilateral (many sides), multifarious (many different types, various) and any other multi word. Similarly, division will help you tackle diversify (to split or to branch out into many paths) and divergent (splitting in different directions, differing, ­contradictory). Subtraction has a root word — trac or tract — which means “to pull.” With the same root word, you’ve got contract (to pull together, to shrink in on itself), retract (literally, “to pull back”; to take back words you’ve already said), detract (literally, “to pull down”; to take away from someone’s reputation), and extract (to pull from, the way a dentist extracts your teeth). Even if you’re not Picasso, draw little figures to illustrate problems when you need help visualizing them. For example, the classic “Evelyn was traveling east at 60 miles an hour and Robert was moving toward her at 30 miles an hour” sort of problem cries out for arrows and lines like the ones shown in Figure 11-3. Figure 11-3: A diagram like this one may help you solve SAT math ­problems.